Aircharge announced the launch of a new mobile application. It is very useful and convenient for users of wireless chargers. 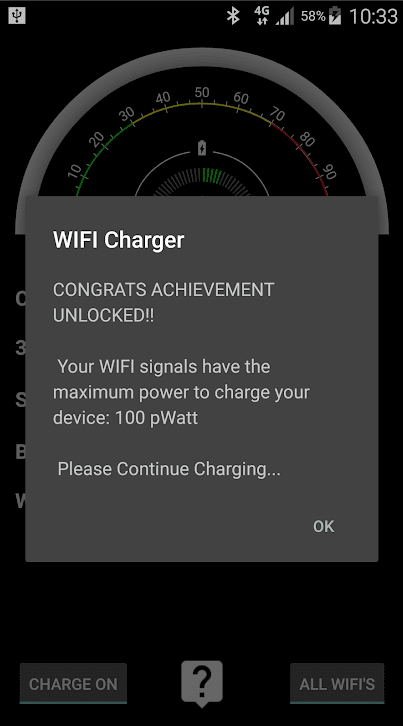 Now, finding a place to recharge your wireless gadget will become even easier, you just need to download this application, mark your point on the map and your device will find a place where it will be possible to completely unimpededly recharge. Currently, there are more than 4,000 active locations around the world for free charging of modern Qi devices. According to experts from the WPC (Wireless Power Consortium), such places will constantly increase, this is due to the high demand for wireless chargers standard “Qi” in the world market among consumers. Also, in connection with this high demand, the production and release of such electronic devices have noticeably increased. Now you can charge your device not only at home or in your office, but in a cafe, in the airport, in the library or even in the gym. The new Aircharge-Qi locator application helps users find the nearest points for charging over a wireless network, where each owner can charge his smartphone or tablet for free. Users of the application can set a sound signal, with which they will never pass by the nearest point to recharge the Qi device. Also, the application can inform you about the neighboring places for recharging, if you make an appropriate request. Additional features include the ability to leave notes and reviews about a particular place of use. It is beneficial and convenient not only to the user of wireless devices but also to the owners of these points because they are their potential customers. All public points for recharging can be added to the application using the Aircharge command. If you think that your smartphone or tablet is charging for an eternity, or you are in a hurry and want to quickly charge your phone, then you should install the Ultra Fast Battery Charger 5X application. This application will help speed up the charging process so that you can leave the house with the 100% charged battery. The application provides all the necessary information about the processes that consume the most battery power on your device. This allows you to immediately see what you have activated and what consumes battery power intensively. Then you will have the opportunity to end the problem with one simple touch. With Ultra Fast Battery Charger 5X, you can charge your device faster by simply turning off all unnecessary processes. Fast Charger is an interesting application that can help to charge your smartphone in a simple and convenient way. You won’t understand how useful it is until you try! Fast Charger can give some impulse to the smartphone’s battery during charging. Using the application, you can monitor the current battery usage, percentage of charging and remaining time. If you charge your smartphone, you will also be able to find out how quickly it is charging and how long it remains before charging ends. Do you think that the smartphone is charging too slowly? The cool function of this application allows you to optimize this process with one click, disabling all applications that slow this process. 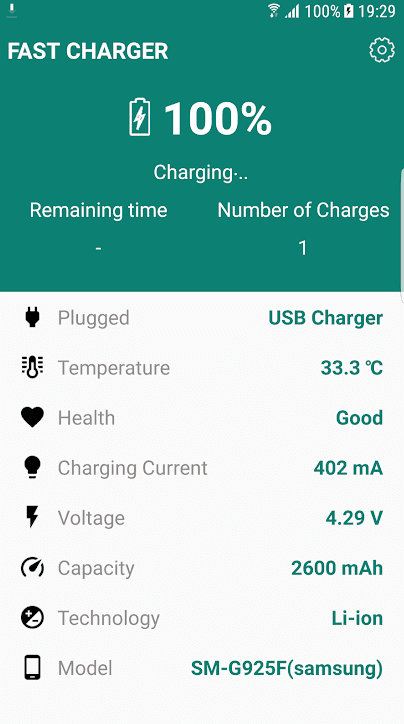 Also, Fast Charger can show the current status of your battery plus all the technical information of the battery and your smartphone, as well as its characteristics. Thus, you will learn all about the device in detail and will be able to reduce charging time by closing unnecessary applications. Fast Charger is an excellent tool that will optimize battery usage. 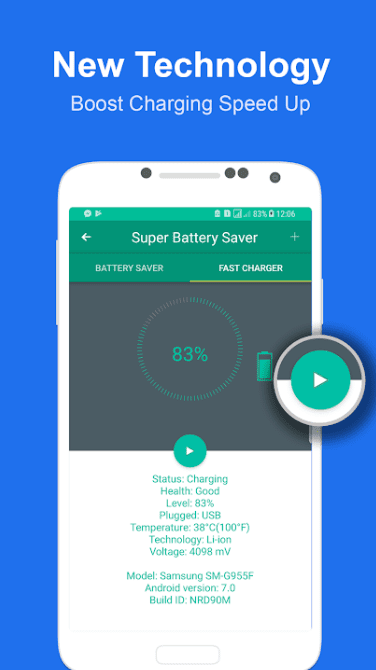 Super Battery Saver – Fast Charger 5x is a very useful application that allows you to optimize the use of a smartphone battery. If you were looking for a similar tool, then you are lucky, because this is an excellent option. 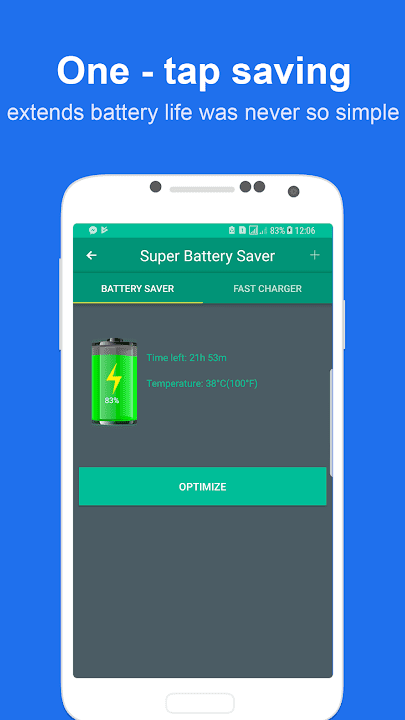 In the application Super Battery Saver – Fast Charger 5x you will find a lot of information that will help you get the most out of the battery of your smartphone. Use this application to learn more about the battery of the device. You can also check the status of your battery. In addition to viewing useful information, you can also increase the battery life with just one gesture. With this simple action, you can make the battery run longer or charge much faster than normal. You will also be able to see how long the phone will last on battery power. Super Battery Saver – Fast Charger 5x is a useful application for optimizing the battery life of the phone, which will provide you with confidence that the smartphone battery works in the best mode, and will work this way in the future. 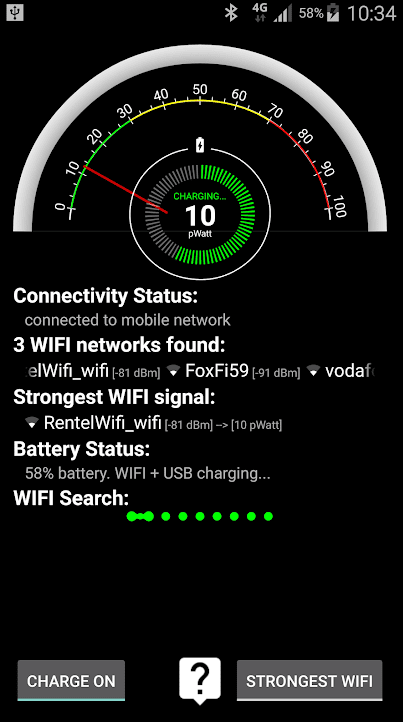 WIFI Charger is an application that charges an Android mobile device with a redundant WiFi signal. Usually, these waves disappear in the open space and on the ocean bottom, but thanks to this application, they can be captured and stored on your mobile device, increasing the battery capacity. Of course, this is all a lie. In fact, the WIFI Charger application does absolutely nothing of the kind. At the moment, it’s absolutely impossible to charge Android devices with WiFi networks, so the only purpose of this application is a joke. WiFi-waves don’t really disappear at the bottom of the ocean. Can you imagine it? The WiFi waves pass through a large blue whale, turning it into a super-whale.